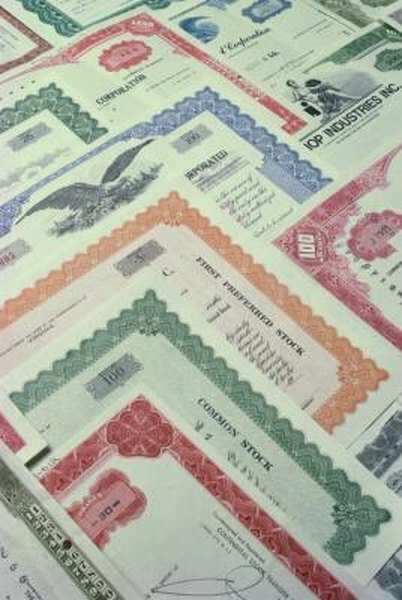 When a person dies, the stock certificates must be transferred into the their trust or estate. When a person dies owning stock, the certificates remain titled in the decedent’s name. You are responsible for selling the decedent’s stock holdings if you are named as the trustee of the decedent’s trust or appointed as the personal representative, also known the executor, in the decedent’s will. Before you can sell the stock, the certificates must be transferred into the name of the decedent’s trust or estate. Look for paper stock certificates in the decedent’s personal files and papers, safe deposit box and estate planning documents. Use the decedent’s past income tax returns, 1099s and financial records to locate the stocks. Find the name of the decedent’s stock brokerage firm and contact the broker. You need to provide a copy of the trust naming you as trustee or the court order appointing you as personal representative before the broker can release any information to you. Call the broker and request a printout listing all the stocks the decedent owned and the market value for each stock as of the decedent’s date of death. Ask the broker to email or fax the documents he needs filled out to transfer the stocks into the trust or the estate. Complete the forms and return them to the stockbroker. Since the brokerage firm is holding the stocks, the shares are transferred electronically. Once the shares are titled in the name of the estate or trust, your broker can sell them for you. Contact the transfer agent to obtain the documents needed to transfer the stocks. At a minimum, you should receive the Affidavit of Domicile and Substitute W-9. Call the decedent’s financial institution and arrange to have the stock certificates Medallion Stamp guaranteed, which guarantees the identity of the person signing the certificates. Do not sign them until you are standing before the financial institution’s officer. Remember to bring your photo identification, original trust document or the order appointing you as personal representative. Make a front and back copy of each document and send them utilizing a tracking service such as certified mail, FedEx or UPS. Your broker can sell the shares once they have been transferred. Make sure that you send a certified copy of the order appointing you as personal representative to the transfer agent. The clerk of court can provide a certified copy for you. Do not have a notary public guarantee your signature on the stock certificates. The transfer agent will not accept the certificates unless they have the Medallion Stamp on them.